All images Copyright 1999 - 2002 S. Guida. All rights reserved worldwide. All the images on this page have been generated by the computer. 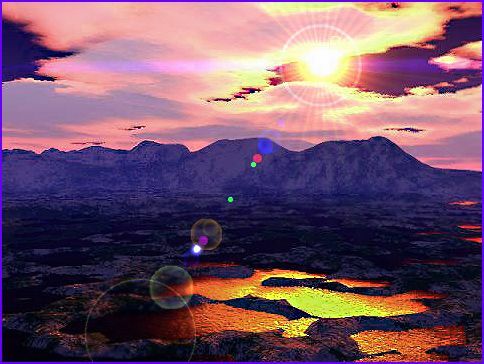 I have used a variety of image generators, commercial products such as Solar Cell (stars), or Bryce 3D v4.0.1 (landscapes); most are freeware, such as Tek Gradator (multicolor gradients), Persistence of Vision Raytracing tool - POVRay (spacescenes and stellar backgrounds), Radiant Lensflare Generator (light effects), Terragen (landscapes), Paint Shop Pro and Adobe Photoshop (digital processing). I hope you enjoy my synthesized landscapes and starscapes!